All matters organizational and technical are supported by Elke Lange who is the secretary at Axel Springer Endowed Chair for German-Jewish literature and Cultural History, Exile and Migration. Ms. Lange has a long history at the Viadrina: In 1996 she started her work as a secretary at the chair of Professor Pollack (Comparative Cultural Sociology). 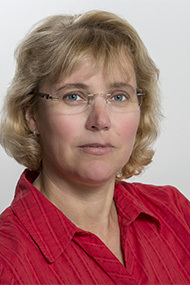 From 2008 until 2016 she worked at the chair of Professor Knefelkamp (Medieval History and Regional Cultural History).